While there has been important progress in housing reconstruction, especially over the last year, the question is: At what price? Shyalmo Tamang stands on top of her home’s newly-finished foundation, Baaskharka Village. In the housing sector, it is true that impressive progress has been made over the past year. According to the NRA, roughly 75 percent of homes have either been completed or are under construction. However, this figure is a bit misleading. In total, 767,705 households have been deemed eligible for the government’s reconstruction grant programme, among which 708,610 signed agreements with the NRA. The vast majority—over 696,000 households—have received the first tranche payment of Rs 50,000. About 370,000 households have been certified to receive the second tranche of Rs 150,000 by building up to the plinth-level following the building code. Thus, only about half of earthquake victims are building or have completed homes that the government has deemed as safe, and are eligible for government funds beyond the initial Rs 50,000. Still, the progress on second-tranche approval over the past year has been significant. A year ago, only about 14,000 homes had received approval for the second tranche. How has this remarkable progress come about? In 2017, the government announced deadlines for housing reconstruction. Initially, it said that victims must complete their homes by July 2018, although it later revised deadlines: Victims must complete homes up to the plinth-level by mid-July 2018 and up to the roof-line by mid-January 2019, according to Bhisma Bhusal, a spokesperson for the NRA. Across the country, earthquake victims are scrambling. On a trip to the Melamchi Valley I took earlier this month, nearly all the earthquake victims I met were busy laying foundations or building walls of homes. Jagat Deuja, the director of the Community Self Reliance Center, an NGO working in recovery, told me: “If you ask people here what they’re busy with, they’ll get angry with you.” That’s because the answer is obvious: Rebuilding, to meet the July deadline. While progress is significant, it has come at a cost: rapidly rising household-level debt. According to a recent study by the UN Resident Coordinator’s Office, nearly two-thirds of earthquake victims took out loans for reconstruction in 2017. In Sunkhani village, located on a ridge above the Melamchi River, Dolma Dong, 42, stood in front of her nearly-complete four-room brick home, explaining how her family financed the rebuilding. In addition to putting in all their savings, they sold their water buffalo and took out loans from a local money-lender. “We built a bit, took out loans, and then built a bit more,” she said. The house was set to cost about one million rupees and the family had borrowed several hundred thousand rupees, for which they were paying 25 percent annual interest. There are many reasons why home reconstruction was sluggish before the deadlines were announced, including delays in finalising the victims’ lists, continuing aftershocks, remoteness of affected areas, monsoon rains, the unofficial Indian blockade in 2015-16, 2017 elections, government devolution processes, and lack of trained manpower and government engineers to conduct inspections. But one of the most important reasons was that families were not financially ready to build. According to a 2017 study by The Asia Foundation (TAF), the most common obstacle to reconstruction was home owners’ lack of financial resources. The median cost of rebuilding a home is approximately Rs 675,000, significantly more than the government grant total of Rs 300,000, according to a survey by Housing Recovery and Reconstruction Platform (HRRP), which assists the NRA. In Melamchi Valley, I met a few earthquake victims who were able to finance rebuilding themselves. In some communities, people are able to save money by buying materials together and pooling labour. Others are sending family members to work abroad: The TAF study found that for households in earthquake-affected areas, dependence on remittances increased from nine percent in 2015 to 15 percent in 2017. The HRRP also notes that some people are rebuilding one-room houses, which don’t meet the sprawling spatial needs of agricultural households. But the majority of victims, it seems, have resorted to borrowing to pay for the gap between reconstruction assistance and needs. The government has a low-interest loan programme for earthquake victims, but no one I met in the Melamchi Valley had been able to access it. Under the programme, the Rastriya Bank provides funds at no interest to commercial and development banks, which lend the funds to earthquake victims at two percent interest. However, the for-profit banks lack incentive to participate in the programme, which requires significant paperwork and human resources. Bhusal, the NRA spokesperson, says that only about 800 low-interest loans have been disbursed, mostly in the Kathmandu Valley. He notes that regular bank loans (usually over 10 percent interest) are also inaccessible to rural earthquake victims, since banks usually require urban land as collateral. 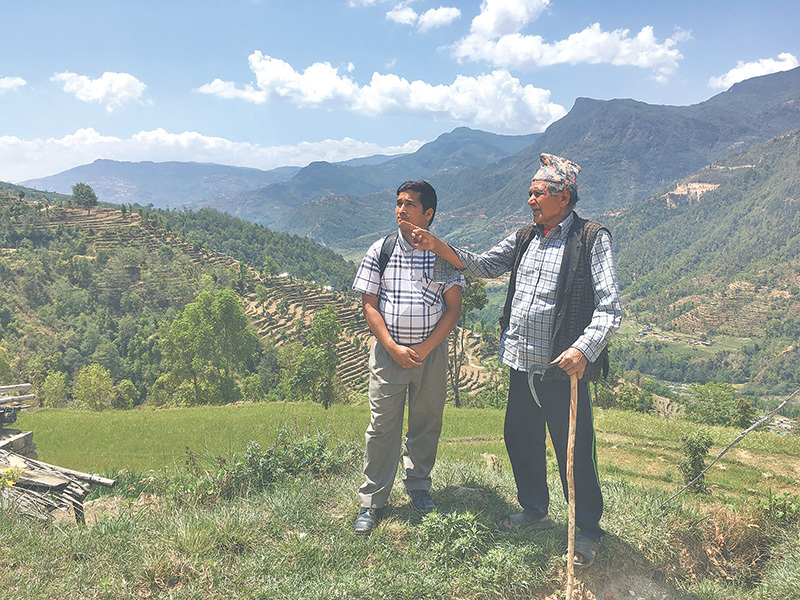 As a result, most earthquake victims take informal loans from local money lenders—typically at 25 percent per year, sometimes as high as 36 per cent. “If people are going further into debt as a result of the earthquake, it poses longer-term questions about their life chances—whether their kids will be able to pursue and get a good education,” Daniel Coyle, the director of People in Need, an INGO working in recovery, said. Meanwhile, Bhusal told me that the NRA is unlikely to extend deadlines again. Asked about the households who may not make the deadlines, he said that some are no longer interested in reconstruction, having migrated away from their villages, while others are illegitimate recipients who abused programme loopholes or got onto victims’ lists due to political pressure. “Even in the case of other quite successful stories of other countries, the coverage is 80 percent,” he said. The government has some programmes to address differential needs of select groups—including a “top-up” grant of Rs 50,000 for the disabled, elderly people without supporters and orphans, and a re-settlement grant of Rs 200,000 for families that must move to avoid landslides. These households are not subject to the current deadlines. But many people must either take out a loan to meet government tranche deadlines, or rebuild at a slower pace, without government assistance. Shyalmo Tamang, 62, of Baaskharka village, recently finished the foundation to her four-room home. She told me she took out a loan for Rs 200,000 at 36 percent interest, and expects to borrow an additional Rs 200,000 before the home is complete. She has trouble sleeping at night because of anxiety over the loan.